Family Tree DNA is a service that provides the latest technology for genealogical research. They offer one of the largest DNA databases out of any company in the DNA business, with a total of 263,316 to date. Of these, 166,100 are Y-DNA records (what we will be collecting in Venice!) and 97,216 are mtDNA records. They work in association with a scientific advisory board and also the University of Arizona Research Labs. The Family Tree’s chief scientist is Dr. Michael Hammer, whose expertise lies in the study of the variations of the Y chromosome as a model system to explore human evolution. Population geneticist are able to use variations on the Y chromosome to create a phylogenetic family tree. The changes in the genetic code are known as Single Nucleotide Polymorphisms (SNPs), or simply base pair variations. Scientists are able to determine when these changes diverged from one another, and can subsequently create these elaborate family trees. An SNP marks the a branch in the y-chromosome phylogenetic tree, and the branch points are known as haplogroups. These are named as A-T. The sub-branches are further known as subclades, which can also be tested by the Deep Clade Testing offered by the Family Tree DNA. Origins are determined by the haplogroup: for example, Haplogroup E originated 50,000 years ago and has been linked to Neolithic expansion of peoples into Southern Europe. Family Tree DNA actually provides the DNA tests to the Genographic Project, one of our sponsors. It might be worth our time to start a Venetian project with them, to specifically focus on the origins of its inhabitants. The Genographic Project is an effort funded by National Geographic and IBM. It is generally understood that mankind came from Africa. 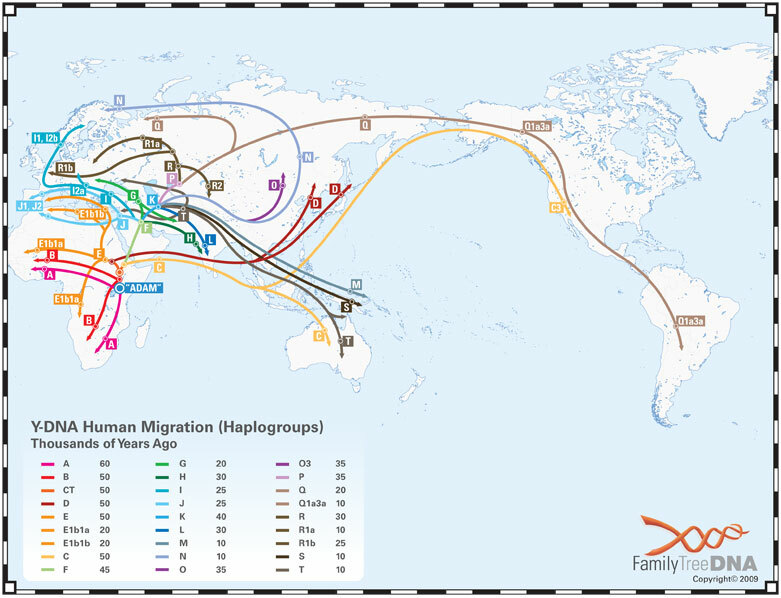 This project is looking to find out more about the migratory pattern of humans out of Africa. They want to know what kind of an impact culture has had on the genetic variation of humans. They also want to determine how the traditions of cultures has impacted genetic diversity. To reach these goals scientists have been collecting DNA samples from males, 18 and older, from all over the world. These samples are then categorized and analyzed. Over itme, the human genome mutates and takes on a slightly modified form. These mutations are passed on to the next generation. Using these various mutations, scientists can track lineage. The Genographic Project is asking for participants from all over the world. For a fee, an individual will be sent a kit to take a sample of his or her DNA. The sample is then sent to one of 10 laboratories all over the world. The funds generated from these kits are put into the Genographic Legacy Fund. This fund “aims to empower indigenous and traditional peoples by supporting locally-led efforts that can also raise global awareness about the cultural loss indigenous and traditional communities face.” These projects range from preserving the craft of embroidery in Gaza to educating students in Ecuador about their heritage.